If you think you've seen everything there is to see in this part of the country...think again. Have you seen Castle Unicorn where you can experience life as it was with King Arthur and the Knights of the Round Table? 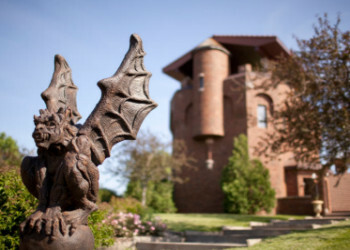 Nestled in Iowa's Loess Hills, this secluded 440 acre estate offers the natural beauty and serenity of the wilderness and at the center an unbelievable castle. This modern day castle, complete with a moat, fountains and of course a tower, has recently been transformed into a wonderful retreat...Castle Unicorn. The Castle Unicorn Bed & Breakfast's innkeeper is John Scott. Guests have the opportunity to hike to the shores of Pony Creek Lake while never leaving the estate or try their luck fishing along Pony Creek or Blum's Pond or simply sharing a picnic lunch, a good bottle of wine and admiring the view. 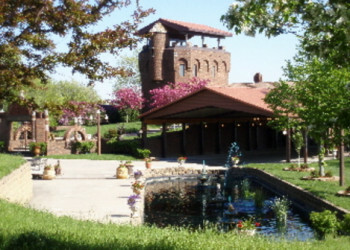 John refers to Castle Unicorn as "a bit of Bavaria in the Heartland."